Our email system has changed! Please sign up HERE on our new Mailchimp form. 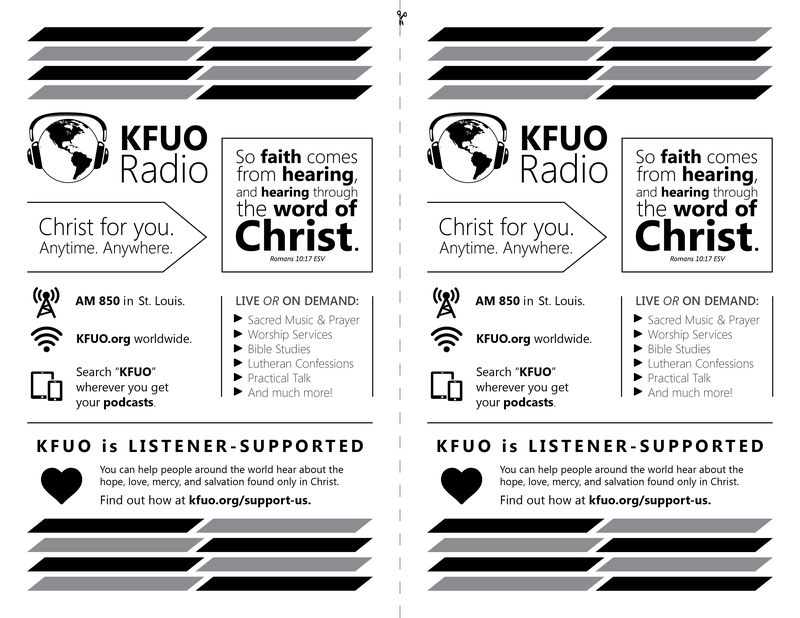 Include KFUO Radio and our programming updates in your church or school’s regular bulletins or announcements. It’s as easy as cut and paste! If you would like this information in your inbox each week, simply visit our Mailchimp sign-up form and register your email address. Be sure to check your inbox to confirm your subscription! Having issues? Send a message to Sarah.Gulseth@kfuo.org. Download and print this flyer and make it available to your church members so they can discover our daily programming and then let others know about Worldwide KFUO. Want to share more detailed information about KFUO Radio’s programming? Download and print this program guide to share with your church! We thank you for your prayers, support, and encouragement as we continue our ministry of broadcasting Christ for you anytime, anywhere. Listen to Worldwide KFUO.org, your radio station for practical Lutheran talk, daily Bible and Confession studies, daily worship opportunities, and current issues from a Lutheran worldview. Programs are archived at KFUO.org for 24/7 on-demand listening. You can also find our programming wherever you get your podcasts! Have a question or comment? Find us at @KFUOradio on Facebook, Twitter, and Instagram. This week on KFUO.org, we continue in 1 & 2 Peter on Thy Strong Word (weekdays at 11:00 a.m. CT), study Genesis 19-21 on Sharper Iron: Truth in Genesis (weekdays at 8:00 a.m. CT), and hear more of the Smalcald Articles on Concord Matters (4/30 at 2:00 p.m. CT). Find your favorite programs on demand at kfuo.org! Listen to Worldwide KFUO AM850, your radio station for practical Lutheran talk, daily Bible and Confession studies, daily worship opportunities, and current issues from a Lutheran worldview. All programs are archived at KFUO.org for 24/7 on-demand listening. You can also find our programming wherever you get your podcasts! Have a question or comment? Find us at @KFUOradio on Facebook, Twitter, and Instagram. This week on KFUO AM850, we continue in 1 & 2 Peter on Thy Strong Word (weekdays at 11:00 a.m.), study Genesis 19-21 on Sharper Iron: Truth in Genesis (weekdays at 8:00 a.m.), and hear more of the Smalcald Articles on Concord Matters (4/30 at 2:00 p.m.). Find your favorite programs on demand at kfuo.org! This week on KFUO.org, we hear the Truth in Genesis 22-24 on Sharper Iron with Rev. Jonathan Fisk and guest pastors (weekdays at 8:00 a.m. CT), continue our conversation about friendships and ministry with Deaconess Heidi Goehmann on The Coffee Hour (5/7 at 9:15 a.m. CT), and study another section of the Smalcald Articles on Concord Matters (5/7 at 2:00 p.m. CT). Hear your favorite programs on demand at kfuo.org. This week on KFUO AM850, we hear the Truth in Genesis 22-24 on Sharper Iron with Rev. Jonathan Fisk and guest pastors (weekdays at 8:00 a.m.), continue our conversation about friendships and ministry with Deaconess Heidi Goehmann on The Coffee Hour (5/7 at 9:15 a.m.), and study another section of the Smalcald Articles on Concord Matters (5/7 at 2:00 p.m.). Hear your favorite programs on demand at kfuo.org. This week on KFUO.org, we wish all mothers a blessed Mother’s Day, hear the Truth in Genesis 24-26 on Sharper Iron with Rev. Jonathan Fisk and guest pastors (weekdays at 8:00 a.m. CT), continue in the Gospel of John on Thy Strong Word (weekdays at 11:00 a.m. CT), and hear God’s Word in Daily Chapel at 10:00 a.m. CT. Find all your favorite programs on demand at kfuo.org or wherever you get your podcasts! This week on KFUO AM850, we wish all mothers a blessed Mother’s Day, hear the Truth in Genesis 24-26 on Sharper Iron with Rev. Jonathan Fisk and guest pastors (weekdays at 8:00 a.m.), continue in the Gospel of John on Thy Strong Word (weekdays at 11:00 a.m.), and hear God’s Word in Daily Chapel at 10:00 a.m. Find all your favorite programs on demand at kfuo.org or wherever you get your podcasts!